The Special Materials Department has two distinct sections. One focuses on source analysis (shiryogaku) and historical geography (rekishi chiri), while the other deals with historical documents kept outside of Japan or written in foreign languages. The former analyzes on Japanese monograms (kaō) and publishes collected monograms in the Kao Kagami. 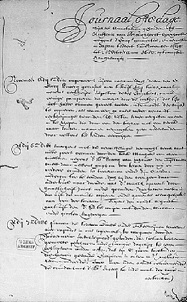 The latter, or the Overseas Materials Section, publishes Jesuit Letters Concerning Japan (-1559, original texts mainly in Portuguese and Spanish) and Diaries Kept by the Heads of the Dutch Factory in Japan (-1651, original texts in Dutch) with Japanese translation. These and comparable European sources enable us to view Japan’s relationships with the rest of Asia in the late medieval- early modern periods. For more details, see publications page. The Overseas Materials Section is also engaged in cataloguing microfilmed documents acquired from overseas. Since 1954, the Historiographical Institute has collected microfilms of unpublished documents concerning Japan kept in overseas libraries and archives. This project was entrusted to us by the Japan Academy, and subsidized by UAI (Union Academique Internationale) and UNESCO-CIPSH until 1985. Since 1985 the Historiographical Institute has continued to collect overseas documents with support from the Japanese government (KAKENHI by JSPS: Japan Society for the Promotion of Science, and MEXT: Ministry of Education, Culture, Sports, Science, and Technology) and other funding organizations. Recently, we have been engaged in the digitization of the microfilm collection as well as acquiring newly digitized materials.